Each person’s perspective is built into who they are. Some people call it “personality” and some refer to it as “temperament.” Ever notice how different that you and your colleagues manager can be from you? Have you ever asked yourself, “Why did they do that?” or “What were they thinking?” The starting point of understanding people is to realize and accept one simple fact: Everyone is not like you! Have you ever said the same thing to two people and received two totally different reactions? How can saying the same words produce such different results? Each person “heard” you differently based on his or her personality style! You said the same thing, but what they “heard” was different. Different is not bad, it is just different! A lack of understanding of ourselves and others can lead to real problems such as stress, disappointment, hurt feelings, unmet expectations and poor communication. As you know, it is hard to work in conflictual contexts when you do not understand what is going on inside the mind of another person. The good news is that there is a simple way to understand how people behave and how they are motivated. We call the concept “The DISC Model of Human Behaviour.” This concept will allow you to unlock the mystery behind developing good people skills and creating better relationships by reducing conflict, improving productivity and relating with others more effectively. D stands for the DOMINANT: Type which is OUTGOING and TASK-ORIENTED. I stands for the INSPIRING: Type which is OUTGOING and PEOPLE-ORIENTED. S stands for the SUPPORTIVE: Type which is RESERVED and PEOPLE-ORIENTED. C stands for the CAUTIOUS: Type which is RESERVED and TASK-ORIENTED. What Is Your PQ (Personality Quotient)? We spend years in school developing our intelligence to effectively use our mind. Developing our unique personality to effectively use our behaviour is just as vital to successful living. Your Intelligence Quotient, or IQ, measures your intelligence. Your Personality Quotient, or PQ, refers to your ability to understand yourself and others for effective communication and teamwork. Studies have shown that technical skill, beginning with intelligence and developed through education and experience, accounts for only 15% of success in the workplace. The other 85% of workplace success comes from people skills! These skills are developed through learning better ways to behave and interact. Why use the DISC® Assessment? Their strengths and how to leverage them. Areas to improve for long-term success. Guidance on achieving maximum performance. How to improve communication with others. How to connect with others effectively. How to promote your ideas and lead others effectively. Insights into how people make decisions so you can work WITH their personality. Understand TEAM dynamics by learning the strengths of each member. Discover each team member’s personality traits. Learn what motivates each member of a team. “Discover Yourself” is an online personality test (assessment) that generates a six-page personality report. This version is a popular cost-effective assessment. This personality report is customized based on the online assessment that will take only about 15–20 minutes to complete. Concise, yet very helpful insights. Includes charts and the respondent’s scores. There are no right or wrong answers, just individual preferences. Even though this is a “mini” version of the report, the online assessment is the same one that is used for the full report. This version is designed to offer extensive feedback while being shorter than the extended version. The 30-page computer-generated report is highly accurate and easy-to-understand. This 15–20 minutes online personality assessment is fully packed with helpful and practical information to help the respondent to understand himself or herself and how to adapt to relate better to others. There are no right or wrong answers, just individual preferences. This personality report is very useful for professional use and personal use. Respondents will learn about their strengths, communication style, decision-making style and gain insights to improve their ability to connect with others. This is a comprehensive DISC assessment and profile report. All new user-friendly, icon-based navigation makes this report fun and easy to read. The respondent can quickly look at the sections of the report he or she is interested in. There are 50 pages of personalized insights in this report. This 15–20 minutes online personality assessment is fully packed with helpful and practical information to help the respondent to understand himself or herself, his or her strengths, possible blind spots and how to adapt to relate better to others. Respondents will learn about their strengths, communication style, decision-making style and gain insights for relating with others and improving their ability to work with others. The Discovery Report Leadership Version is a groundbreaking personality assessment and profile designed to help any person to be more effective as a leader. It features a revolutionary leadership model that will give the respondent a whole new understanding about how to lead others. He or she will learn about adaptive leadership techniques and be given specific “how-to” guidance. Respondents will receive more than 60 pages of feedback and insights in this comprehensive resource. A user-friendly, icon-based navigation menu makes this report easy to use. The report is highly accurate, easy to understand and practical to use. The online personality assessment will take about 15–20 minutes to complete after which the report will be instantly available. 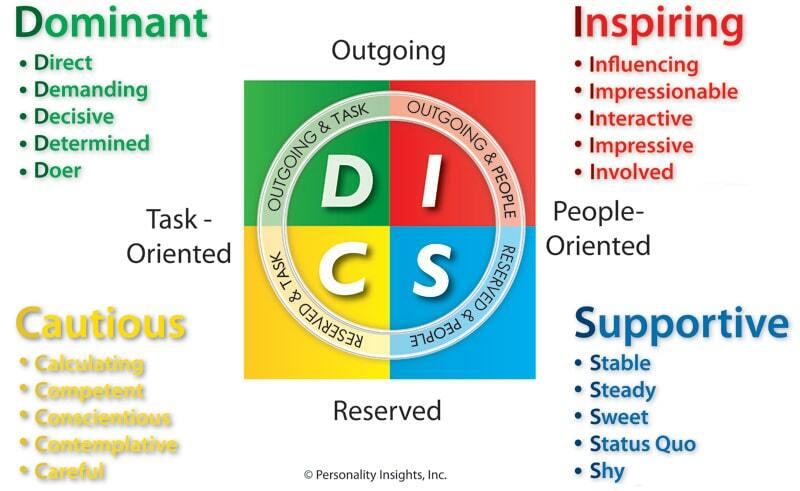 This is a cutting-edge report that combines the best insights using the DISC personality model with over 20 years in leadership training experience. Contact us to receive copies of sample reports. Must be administered by a certified practitioner.